There are many ways to break windows passwords, I will show you how do do it with Cain & Abel v2.0. It is powerful hacking tool which can break of various kind of passwords using Dictionary, Brute-Force, Cryptanalysis attacks … This tutorial tells you how to break administrator password and gain access to admin account with Brute-Force attack. 1) Download Cain & Abel v2.0 from this link and install it. 5)After this will appear windows accounts , right click on account you want to break password and choose type of attack , in this example I chose brute force attack. Brute force actually means to start with a letter a and encrypting it. Then see if the encrypted strings match. If not then b, c, … until we’ve gotten to admin. Then the encrypted strings will match and we’ll know that is the right password. Brute force attack is the slowest method of cracking, but there is no risk that you’ll not find the password. The thing about brute force is that the time of cracking rises rapidly depending on how long the password is, how many characters are being used in it and so forth. I hope this tutorial has helped, if something isn´t clear , don’t be afraid to ask questions to me! 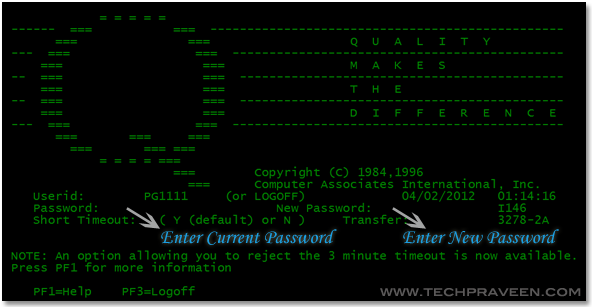 How To Change IBM Mainframe TN3270 Password?